In Spring I bought some seedlings for my planter boxes. In the mix were three Thai Dragon Chilli seedlings and a Habanero seedling. The Habanero has decided to sulk big time and make no flowers, but the Thai Dragon Chilly plants went crazy and made so many fruit that I knew I had to concoct a plan for using them. 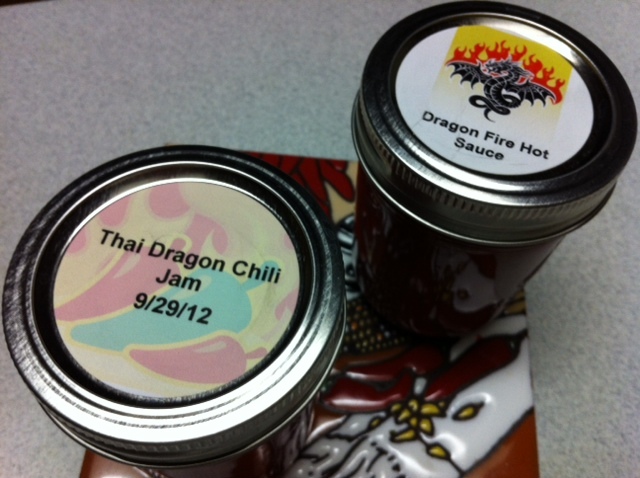 A colleague who loves to ca stuff suggested Thai Dragon chilli jam and I was instantly on board. The canning paraphernalia was hers (though I am very tempted to go out and get my own set of equipment) and today we set to work. On the cards was a Chilli Jam, a Hot Sauce and some Hot Chilli oil. 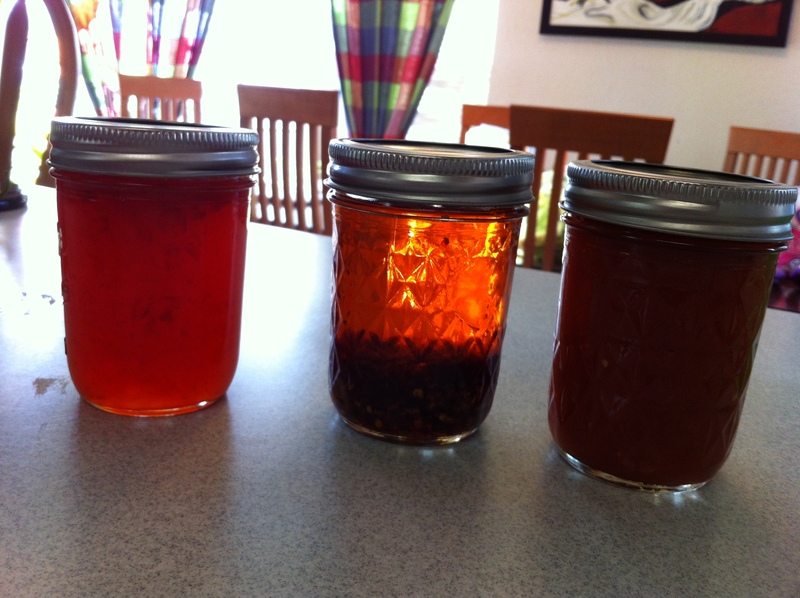 The final results are fantastic, and the jam is super hot and super addictive. I ate a bunch of it with walnut bread and cheese, and loved it. Combine tomatoes and peppers and 2 cups vinegar in a pot and cook until soft. Process through a food mill and discard skins and seeds. Add sugar, salt, spices in a muslin bag, tomato sauce, and garlic. Add 2 cups vinegar. Cook for 30 minutes. Ladled into jars that were boiled for 10 minutes, process for 15 minutes with lids on. Yields 4 half pints. Prepare jars by boiling for 10 minutes. In a blender add Thai dragon peppers, and 1 cup vinegar and process until smooth. Strain into a saucepan. Reserve the skins, and seeds for making Hot Chilli Oil. Puree the bell peppers in half cup vinegar. Combine Chilli and pepper puree, add rest of vinegar and sugar and boil over high heat stirring constantly for 10 minutes. Stir in pectin, boil hard, stirring for 1 minute. Remove from hear, and skim foam if any. Fill jars, 1/4 in head space. Process for 10 minutes with lids on. Chilli chopped or remaining after straining from Jam recipe. Heat oil, add chillies and cook for 5 minutes until oil takes on red hue. Ladle into jars with the chilli residue. Use to season pasta, pizza, or to lightly pan fry tortillas in a few drops of chilli oil on each side. And then we christened the products and feasted on them! A word of caution on handling these chillies. They are extremely HOT, and will get into your throat and eyes with painful consequences. We worked with the exhaust on and kept water handy. I planted a mix of chilli seeds and am waiting to see what grows. Chilli jam is so addictive – I love it. 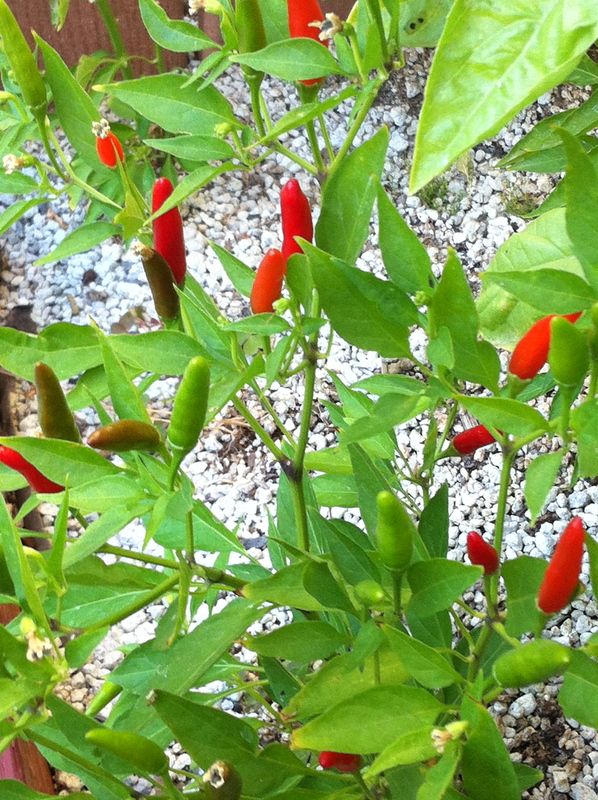 I have bookmarked this post for when/if I too have a chilli crop to deal with. Thanks! I am totally addicted to this jam and also to canning, getting ready to buy my own canning supplies. Let me know how your chillies are growing.